Move the equipment away from the line, if you can do so safely. Have someone call 911 and PG&E right away at 1-800-743-5000. Stay on the equipment until utility employees say it is safe to get off. If you MUST get off the equipment due to fire or other danger, jump clear. Land far enough away from the equipment that you don’t touch the equipment and the ground at the same time. Land with your feet together and shuffle away with small steps, or hop away on two feet, keeping both feet together. 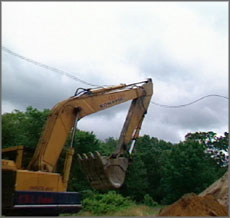 If your equipment touches a power line, wait on the equipment until rescue workers arrive. If you must get off, jump clear without touching the equipment and the ground at the same time, and shuffle away with small steps or hop away on two feet, keeping both feet together.